In July 1975 I was sitting on a platform at a railway station on the outskirts of Paris. Someone on the opposite platform had a cassette player. I could hear a voice, monotone, clear, concise, dark but the melody captured me. It was Leonard Cohen singing The Partisan from his 'Songs from a Room' album. I was hooked. When I got back to England I bought all four of the albums which he had out at the time. There were also two novels and around six poetry books. His deep voice with all its wisdom, love, pain and honesty consumed me. He soon became my biggest influence and source of inspiration. Indeed, his fine spectrum of work is the 'Hallelujah' of my very own personal, private religion. On Wednesday 9 November 2016 rumours across the internet suggested that he had died the previous Monday, Indeed a formal announcement was made after his funeral by his son Adam on Thursday 10 November. Needless to say, I shed more than just one tear when everything became apparent and sadly real later that day and into Friday. Leonard was buried privately and laid to rest in an unadorned pine coffin next to his beloved mother and father in Montreal, Canada. 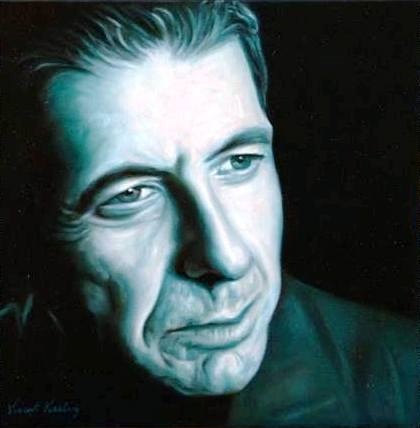 My ambition was always to meet Leonard, to shake his hand, to thank him for his music and poetry. To thank him for his wisdom and his voice - a voice that has guided me through dark and difficult times and uplifted me. Of course that will never happen now. Leonard Cohen was a true gentleman and a master of his craft. His spirit will walk with me forever. I loved him and I will continue to love all the words and music that he has blessed me with.